Dusk is located on the shores of Summerset Isle, hidden behind the southern mountains, only accessible through a narrow valley behind the town of Sil-Var-Woad. Dusk Keep is the only building in the area, and it overlooks the beach where the valley empties into the Eltheric Ocean. Buried deep in the mountains, west of Dusk lies the Colossal Aldmeri Grotto, a vast cavern with ancient ruins that once served as the High Elven navy's watering spot. The area is known to contain a variety of Gryphon known as the Pale-Plume Gryphon, which are uncommon and live in the seaside cliffs of Dusk Keep. Dusk is neighbored by several settlements, including Archen Grangrove in the west, and Silver Wood in the northeast. For the longest time, the site where Dusk would be located contained nothing but Dusk Keep, an isolated tower that held some sort of magical containment. The tower's origins are unknown, and it would remain there for quite some time, as far as the late Interregnum. 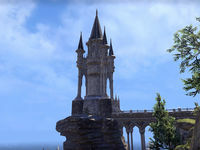 During the time of the Second Aldmeri Dominion, in the ninth century of the Second Era, a port was built near Dusk Keep, which would then become the basis for the modern-day city-state of Dusk. During the Imperial Simulacrum in the late Third Era, the city-state of Dusk was an active settlement, being ruled by King Saura. It had a rivalry with Shimmerene. By the Fourth Era, the city-state of Dusk would become a primary port for the East Empire Trading Company. This page was last modified on 29 March 2019, at 21:18.